The Cape Peninsula University of South Africa is working on establishing a research collaboration with the Midlands State University to promote quality in the field of academic research in the region. 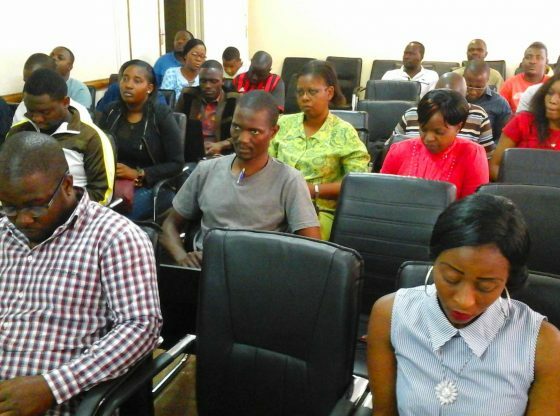 This was revealed at a Capacity Building workshop on research hosted by the Department of Information Systems for post graduate students at the MSU Harare Campus on Sunday 9 September, 2018, following the successful hosting of a similar workshop at the Main Campus in Gweru. Visiting scholar from Cape Peninsula University, Professor Ephias Ruhode revealed, the project will be at post graduate level and involve Masters and PhD students as well as all academics involved in research. He however could not shed more light on the collaboration since the project is still in its early stages. “I wouldn’t want to pre-empt because we have put the documentation together so that we launch the application to the AU, so am not going to pre-empt because we are still at the application stage . We talk about it because we are hopeful it will succeed. If that one does not come to fruition then these kind of collaborations in terms of visits will continue,” said Professor Ruhode. MSU Lecturer in Information Systems Dr. Theo Tsokota said the workshop which covered proposal writing, literature review and data gathering among other areas is important as it came at a time when over 60 post graduate students are working on their dissertations. “We are looking at issues of synergies and visiting scholars assisting us in the field of research. He is bringing in a new perspective which is different than the ones our students are used to. We are also going to benefit as lecturers because we are saying Prof. Ruhode has marked several dissertations and he has also been an external examiner in different countries. So this is an exposure which some of us here don`t have at the moment so it think it will help us,” he said. The one day workshop was funded by the National Research Foundation (NRF) funding of South Africa on Knowledge, Interchange and Collaboration(K.I.C) . The thrust within National Research Foundation is to establish research collaborations amongst African universities so that academic institutions in the continent are at par with their counterparts in the BRICS and European Union countries where similar arrangements are in place.